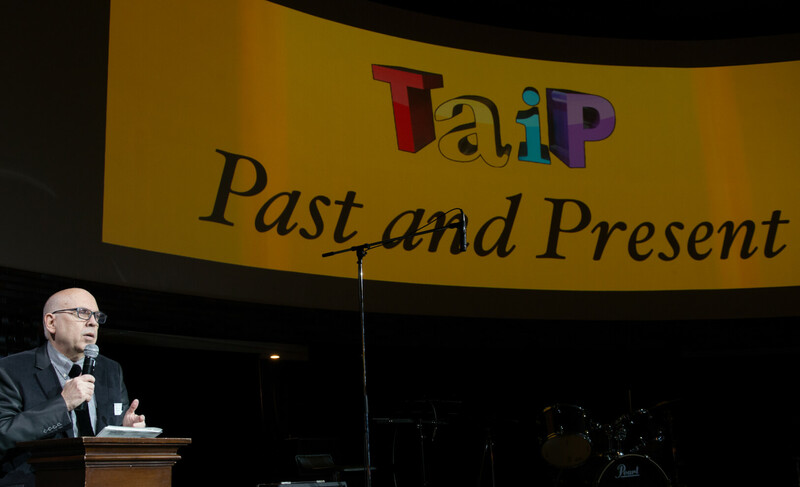 Learn about the TAIP and it mission. New International School Founding Director/Head of School Steven Parr speaking at the TAIP 10th Anniversary Celebration in 2015. The Tokyo Association of International Preschools was established on March 1, 2005, with the mission to support international preschools in the Tokyo area in terms of networking, staff development, parent education, and publicity. The schools collectively recognize that the selection of a school for one’s child is a great responsibility and for that at least a first step is to know which schools are available. The Schools page on this website lists all of the members schools in alphabetical order with direct links to their websites. We would encourage parents to visit by appointment any school in which they may be interested. TAIP does not endorse any particular program and offers equal support and opportunities to all of its members, regardless of the size of the school. The association’s activities and services are funded through annual membership dues, and sponsored or co-sponsored workshops and events. Members can enjoy several services such as networking meetings, workshops, seminars and much more. Will receive a link on this web site and receive a membership certificate. Will be emailed news and events posted to the TAIP website. Will have access to the TAIP Media Room with live streamed and recorded PD materials. Director or Designated Representative may attend board meetings, vote, and be nominated to serve as an officer in the Association. Member of institution may attend workshops and seminars at member rates. Director or Designated Representative may attend board meetings and vote. Will receive a link on the website and receive a membership certificate. If educational association or institution, any member of the organization may attend workshops and seminars at member rates. If publishing company or other type of supporting organization, may be invited to exhibit or present at conferences, or workshops at an extra charge depending on the audience size and venue. A designated representative may attend general membership meetings and may be nominated to serve as co-Director member of the board, or serve on committees set up by the board. May attend general membership meetings and may be nominated to serve as a co-Director member of the board, or serve on committees set up by the board. ‍Section A: Name of Association The name of this association shall be the Tokyo Association of International Preschools (TAIP). 1. An International Preschool is defined as any school, which offers an early childhood program prior to Grade One, whose primary or secondary medium of instruction is a language other than Japanese. Schools which also offer programs beyond the pre- school level may also be members, but it is understood that this organization is to serve their preschool divisions. 2. The Greater Tokyo area is defined by TAIP as the 23 special Tokyo Wards, all towns and villages bordering the 23 special Tokyo Wards to the west out to Okutama, and the prefectures Kanagawa, Yamanashi, Saitama & Chiba. The mission of TAIP is to support the collective interests of the many international preschools in the greater Tokyo area in terms of networking, staff development, parent education, and publicity for the ultimate benefit of the preschoolers. TAIP does not endorse any particular program and offers equal support and opportunities for its members, regardless of the size of the school. (d) sponsorship or co-sponsorship of professional development seminars or courses for teachers, staff and/or parents. TAIP shall be non-profit in character. Any funds raised are to be used exclusively to support the activities of the organization. There shall be the following categories of membership: Institutional Membership, Satellite Membership, Individual Associate Membership, Institutional Associate Membership. (1) Institutional Membership: Any international preschool in the greater Tokyo area, as defined in Article I, Section B, that shares and subscribes to the purposes of the association as set forth in Article II, may become an institutional member through written application by the Director of the school, acceptance by the Executive Board, and the payment of dues. All of the employees of a member school may attend sponsored events at membership rates. The Director of the institutional member school or his/her designated representative may vote and serve on the board by election as President-Elect, or in another capacity by invitation of the President-Elect. (Designated representative shall be defined in this document as any person whom the principal or director chooses.). (2) Satellite Membership: Any international preschool outside the greater Tokyo area as defined in Article I, Section B, that shares and subscribes to the purpose of the association as set forth in Article II, may become a satellite member through written application by the Director of the school, acceptance by the Executive Board, and the payment of dues. All the employees of the member school may attend sponsored events at membership rates. The Director of the satellite member school or his/her designated representative will receive news of events & posts by member schools; a link and logo on the TAIP website and included in all publications and PR endeavors that TAIP makes; access to the Member’s Area content of the site & access to PD videos and streams. Satellite members do not have voting rights and they do not have access to TAIP Teacher Leadership Programs. Only schools registering for membership from January 2014 and who are outside the greater Tokyo area are eligible for this type of membership. Preschools that are outside the greater Tokyo area have the choice to join TAIP as Institutional Members or Satellite Members depending on the benefits of interest. (3) Individual Associate Membership: Individuals not affiliated with member schools but supportive of the organization may join the organization as Individual Associate Members through written application, acceptance by the Executive Board, and the payment of dues. Individual Associate Members do not have voting privileges and may not attend or receive the minutes of the Directors’ meetings; however, they may attend general membership meetings, they may be nominated to serve as co- Director members of the board, they may serve on committees, and they may attend events sponsored by the organization at membership rates. (4) Institutional Associate Membership: Institutions or companies supportive of the preschools, but who are not eligible for full institutional membership may join the association as Institutional Associate Members through written application, acceptance by the Executive Board, and the payment of dues. They do not have voting privileges and they may not attend or receive the minutes of the Directors’ meetings. They are, however, entitled to a link on the website under Institutional Associate Membership. Depending on the nature of the organization, they may also send representative(s) to an event at membership rates or exhibit books and educational materials or other kinds of materials at events for an additional charge, at the invitation of the sponsors of the event. Designated representatives may attend general membership meetings and may be nominated to serve as co-Director members of the board, and they may serve on committees. (5) Grandfather clause: Should membership eligibility requirements be amended, prior members shall remain members subject to payment of dues, provided that they continue to meet the membership requirements at the time they joined the organization, and that they continue to abide by Section D(3) below. Section B: Term of Membership The term of membership shall be from January 1 of one year to December 31 of the next year. The first term of membership shall begin immediately upon acceptance of application and continue through December 31st of the following year. All terms of membership and payments thereafter shall begin on January 1 and end on December 31 of each additional year of membership. Section C: Renewal of Membership Membership is automatically renewed with the payment of the dues for the subsequent year or years. (1) Membership is automatically terminated if the dues are not paid for the next year by December 31st. (2) Membership may be terminated by a written statement from the Director of the institution holding the institutional membership, individual associate member, or the representative officer of the institution with associate membership, requesting the termination. (3) Membership may be terminated by just cause should the member or member school fail to abide by the provisions of the Association’s constitution, by- laws, ethical guidelines, and/or other criteria if and when they are adopted by the Association. (1) The Director (Chief Executive Officer) of each member school shall have one vote, and only one vote, regardless of the size of the school. (2) Only the Director or his/her Designated Representative may vote. (3) Authorization for representation must be in written form, specifying the designated representative either for a particular meeting or for the year. (4) The Director or the Designated Representative must be present at the meeting to vote on matters decided at that meeting. (5) In items submitted for a vote, a quorum shall be represented by 50% +1 of the members in attendance at that meeting. Voting rights of members not in attendance are waived at that meeting. (6) Associate members shall not have voting privileges. Section A: Executive Board The organization shall be governed by an Executive Board, which may include a President, Immediate Past President, President-Elect, Secretary, Treasurer, Program Director, Publicity Director, Webmaster, Technology Director, and other officers as designated by the Executive Board. Section B: Until the organization is formally inaugurated, the steering committee shall serve in place of the Executive Board. That committee shall nominate the first slate of officers, to be ratified by a simple majority vote at the inaugural meeting of the organization, along with the constitution and by-laws, whereupon the organization will officially begin. Section C: Nomination and Election of President-Elect: The President-Elect will be elected on an annual basis from among the directors of the member schools or their designated representatives and serve his/her first year as President-Elect and the subsequent year as President. Nominations may be made by any association member with the prior permission of the person to be nominated. The Executive Board shall receive the nominations and put forth the slate of candidates two weeks prior to the Annual General Meeting, to be held in October, and the annual election will be held at that meeting. Section D: Selection of the remaining officers: The President-Elect shall constitute the other members of his/her Executive Board by invitation from among the directors of member schools or their designated representatives, in a slate of officers to be ratified by a simple majority vote at the annual October meeting. They shall serve in their positions for the duration of the next calendar year. However, they may serve subsequent or other terms in the same or different roles if they are invited to do so by the subsequent President(s)-Elect. Section E: Immediate Past President, and Past Presidents: The Immediate Past President shall serve as a voting member of the Executive Board. In the event that the current President is unable to complete his/her term, the Immediate Past President shall serve as President for the balance of the term. Past presidents, after their year as Immediate Past President, may serve as ex- officio, non-voting members of the Executive Board, or they may serve in a different officer role if invited to do so. However, they may not be re-nominated or elected again as President unless at least three years have elapsed since their previous term as President. Section F: Executive Secretary The Board may employ an Executive Secretary and provide an honorarium for his/her services on a year-by-year basis. His/her term shall be the same as the term of the officers. If and when there is an Executive Secretary, he or she shall be a non-voting member of the Executive Board. Section G: Mid-term vacancies. Mid-term vacancies may be filled by invitation from the President. Committees may be appointed by any of the officers according to function, and committee members may include Directors, teachers, or other members of the community. Service on committees is voluntary. Section A: Fiscal Year The fiscal year of the association will be from January 1st of one year to December 31st of that same year. Section B: Collection of Funds Any funds collected by the organization are to be deposited in a single bank account under the name of the organization. The preferred method of payment is by bank transfer in the name of the organization or the individual making the transfer, so as to assure transparency of the records. Section C: Allocation of funds: Expenses up to an amount specified in the by-laws may be approved by the President. Expenses of more than the amount specified in the by-laws must be approved by the majority vote of Executive Board. Expenses are never to exceed the funds available in the organization’s account. Section D: Honorarium for the Executive Secretary (if any): The honorarium for the Executive Secretary will be decided on an annual basis, as specified in the by-laws. Section E: Audit The account books will be reviewed by an independent auditor during September of every year. Section F: Dues Dues shall be decided on an annual basis, as specified in the by-laws. No part of the net income, revenue, or grants of TAIP shall inure to the benefit of any member or officer of the organization. In the event of dissolution or liquidation, remaining assets shall be transferred to an organization chosen by the Board of Directors Executive Board for charitable and educational use and with purposes similar to those of TAIP. These articles may be amended by a 2/3 vote of the member schools present at a general meeting. ARTICLE I: Address The business address of TAIP will be the address represented by the President of TAIP until or unless an office is established for an Executive Secretary or Executive Director. ARTICLE II: Meetings The Annual General Membership Meeting will be held within the first two months of the calendar year. The exact date of the meeting will be posted on the website and circulated to all of the member schools, or prospective member schools by e-mail. These meetings are open to Institutional Members, Institutional Associate Members, and Individual Associate Members of the organization, and they may also provide agenda items in advance of the meetings. Executive Board meetings will be held at least four times prior to and after the AGM and annual conference. The board may meet more often as needed, and they may call other general meetings as they see fit. Directors’ Meetings, as distinct from General Membership or Executive Board meetings may also be called by the Board. Only the directors of institutional member schools or their designated representatives may attend the Directors’ Meetings. Minutes will be taken by the Secretary and distributed only to the Directors or their designated representatives. Such meetings will be called only if and when there are matters to be discussed or decided among by the directors alone. (a) Officers: A quorum will consist of a majority (50% + 1) of the officers, including the President or President-Elect. (b) Quorum of the total membership: A quorum of the total membership shall consist of a majority (50% + 1) of the directors or designated representatives of the member schools. (c) Annual General Meetings and Director’s Meetings: Business will be conducted by a majority vote of Directors present at the meeting. (a) Meetings of the Association shall be conducted according to Robert’s Rules of Order and/or ground rules as may be established by group agreement. (b) The Executive Board shall meet before and after every general meeting, and more frequently as needed. (a) Dues are recommended by the Executive Board for the following year and voted upon at the October meeting. They shall cover the period of January 1 of one school year to December 31 of the next, with the exception of the first payment, which shall cover from the date of acceptance of application through December 31of the following year. (b) Method of Payment of dues: Dues are to be paid by bank transfer in the name of the organization or individual associate member. (a) Legitimate expenses shall include the expenses of holding meetings or seminars, stationary, copying, and mailing costs, provider and hosting services for the website, publicity or advertising expenses on behalf of the membership as a whole, the funding or partial funding of professional development workshops, for which attendees will be charged at membership or non- membership rates. (b) Events may be sponsored or co-sponsored with the general guideline that the cost to the members attending should be minimized, with an anticipated income of no more than 30% over the actual costs incurred going into the Association’s account to support its activities. (c) At least one third of the income of the organization will be designated for collective advertising costs and at least one third will be used for professional development. (a) In the case of full sponsorship of events, TAIP will cover all of the costs and retain all of the income. (b) In the case of co-sponsorship, TAIP will cover half of the costs and retain half of the income. (c) In the case of multiple-sponsorship, the sponsors will equally share the costs and equally divide the income. (d) TAIP will not sponsor or participate in the sponsorship of any event in which a loss is anticipated. (e) Member schools hosting a professional development event may have it publicized through TAIP provided that they offer a reasonable discount to TAIP Members who attend the event. The Executive Board of the Association may make reciprocal agreements on behalf of the association with other similar organizations/institutions which offer workshops, conferences, seminars, higher education degree programs, etc., whereby the members of each organization may attend/enroll at discounted or member rates. The Executive Board may purchase associate or institutional membership in another professional development organization for TAIP on behalf of the member schools on an annual basis, subject to availability of funds and perceived benefits of membership. (a) The President The function of the President will be to prepare the agenda, to preside at the meetings, to field membership inquiries and applications, and to authorize expenditures of up to 100,000 yen. Expenditures exceeding this amount must be approved by the Executive Board. He/she shall also be the “owner” of the web- based membership contact data of all the member schools. He/she shall also invite prospective members to join the organization and pursue affiliation with similar organizations on behalf of the total membership. The president shall moderate postings on the association website by member schools. (b) Immediate Past President The function of the immediate Past President is to advise the President and to provide continuity on the board. He/she will serve the balance of the term of the President should the President resign. (c) President-Elect The function of the President-Elect shall be to assist the President, to preside at meetings in the absence of the President, and to maintain and update the membership list by category of membership. He or she will also compile and archive the data from the annual membership survey, and be the co-owner of the web-based membership contact data of all the member schools. At the Annual General meeting of his/her year as President-Elect, he or she shall nominate the other members of the Executive Board who will serve during his/her term as President. (d) Secretary: The function of the Secretary will be to take attendance at meetings, to take and disseminate the minutes, and to maintain the archives of the organization. (e) Treasurer: The function of the Treasurer will be to make a report on the financial standing of the organization at each meeting, having received a statement of accounts (income and expenses) from the Executive Secretary, or having prepared such a statement in the absence of an Executive Secretary. He or she will also send bank transfer information, and issue statements or receipts as needed. (f) Webmaster/Technology Director: The function of the Webmaster/ Technology Director will be to design and maintain the website and to assist members in registration and utilization of the website. (g) Program Director: The function of the Program Director shall be to plan and oversee any conferences, workshops, seminars, or events sponsored or co- sponsored by the association, with the assistance of a program committee if needed. This shall include inviting Associate Institutional Members to present or exhibit at events as possible in consultation with the school or other venue providing the facilities. The Program Director may name a Co-Director. The function of the Program Co-Director shall be to work with the Program Director in all of his/her capacities, with a division of tasks to be worked out by the parties themselves. (h) Publicity Director: The function of the Publicity Director will be to publicize the organization in the wider community, and to oversee both paid and free advertising on behalf of all of the member schools, with expenditures approved by the President. The Publicity Director may name a Co-Director. The function of the Publicity Co-Director shall be to work with the Publicity Director in all of his/her capacities, with a division of tasks to be worked out by the parties themselves. (i) Japanese Education Liaison: The function of the Japanese Education Liaison shall be to serve as a connection between the Ministry of Education as an advisor and as a source of information concerning legal policy and governance within the realm of education. (j) Officers as a whole: The officers as a whole, together with the Executive Secretary (if any) , shall constitute the authorized representatives of the organization for purposes of social or political advocacy, and they shall fulfill or assure the fulfillment of the functions of the Executive Secretary in the absence of an Executive Secretary or until an Executive Secretary has been put in place. Also, they shall prepare a budget and/or expenditure guidelines for the subsequent year based on the current account balance and anticipated income. Officers shall be officers on a volunteer basis only: They shall accrue no income from the organization or its activities. If and when there is an Executive Secretary, the duties and compensation will be defined in the by-laws. 1. Total number of students enrolled in the preschool program classified by the nationality of the parent(s), as of November 1st. 2. Other items as agreed upon by the Executive Board. (b) Schools may elect not to participate in the survey, but the results of the survey will be reported only to the schools that do participate. (c) The data will be summarized and aggregate numbers (with no breakdown of the data by school name indicated) will be distributed to the directors of all participating member schools by e-mail prior to the Annual General Membership meeting. (d) The data will not be published on the web site, but may form the basis for general statements about the membership as a whole. (e) The purpose of collecting the data is so that trends may be noted in the total numbers and nationality distribution of the students over time. (f) Directors of member schools may make other on-line surveys of the member schools, but participation is voluntary, with the general rule that only those that participate will receive the results of the survey. (b) Membership pages with direct links to websites of the member schools, associate organizations, or individuals belonging to the organization in alphabetical order on each page. (c) Events/calendar pages announcing coming events. (f) On-line membership application form page. (g) A list of current officers. ARTICLE XVI: Equal Membership Benefits Any member school is an equal member regardless of the size of the school. Any published publicity funded by the organization must be for all of the schools together. ARTICLE XVII: Amendment of the By-Laws These by-laws may be amended by a majority vote of the member schools at the Annual General Membership meeting or a Directors’ meeting. The TAIP Conferences and workshops sponsored or subsidized by TAIP or by its member schools are intended for professional development and networking among colleagues, which are two of the three purposes upon which the organization itself was founded, the third being publicity. Indeed, our constitution specifies that at least a third of our income be used to provide or subsidize professional development opportunities for our members. Such events are generally open to teachers and administrators of both member and non-member schools, and some attendees may come from the wider community. Of course, when schools host workshops or conferences, it gives them an opportunity to showcase their facilities and their program, and teachers or administrators who attend may have an interest in joining that school in the future. They are always free to submit resumes or respond to advertisements that may subsequently appear. It is, however, inappropriate for an administrator at the host school or any of the other schools to actively solicit teacher applicants or to offer positions at such workshops to teachers who may be in attendance, as it clearly destroys the integrity of the occasion and could well lead to administrators hesitating to send teachers or junior administrators to workshops lest they be poached, and to teachers thinking of them or using them as job fairs rather than as professional development opportunities. It is understood that the administrator(s) of any school that wishes to host a TAIP workshop or conference or that uses the TAIP network to attract attendees to a school-sponsored workshop will refrain from such activities.